If you follow me on Twitter you may have seen that I totally forgot about my blogoversary was super excited for my blogoversary! It's hard for me to believe that it's been a whole year since I started this blog. ... and let me just say, a whole lot has happened in just one year of blogging. Not too shabby for a blogging newbie if I do say so myself. I got a grand total of: 9, 192 views! I met a ridiculous amount of blogger friends through Twitter! 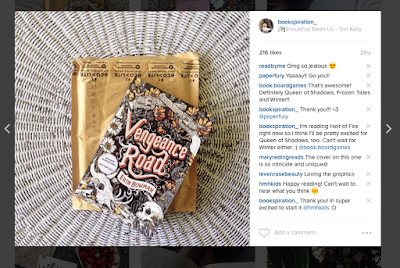 It's been absolutely amazing being able to interact with other booklovers, like myself. Being part of the Truthwitch street team was an absolutely amazing experience. I met so many amazing people. But I specifically want to say thank you to the Fire Clan. Sondra, Em, Aneli, Jana, Megan I freaking adore all of you. You guys have made me laugh, and cry-laugh (craugh? no that's something entirely different) Skyping with you guys is always amazing and hilarious. Being a blogger newbie was... hard? I guess it has been hard in a sense. When I first started blogging I had zero idea what I was doing (and it shows in my first few posts.) But once I discovered Twitter and a ton of other bloggers, there were a few that really stood out to me. I could look up to these people when I needed blogging inspiration/ motivation. These bloggers overall inspired me to be a better blogger. When I first entered the blogging community I didn't really have any friends. But Nori's RQWN chat really changed that. It allowed me to meet new people (new fabulously amazing people) and I will be forever be grateful for that. Nori is one of those people that you want to be friends with. She has such a lovely personality and is always willing to help out other bloggers. Plus, she is super good at planning ahead. Nori, teach me your organizational ways. Cat, your kindness is infectious and I want to thank you for talking to me and just being an overall nice person. You've made me laugh when I wasn't feeling super happy and I adore you for it. Gabi, little fish, unicorn of magicalness, I'm so happy that I've gotten the chance to talk to you. You can make me smile at the most random times. Thank you for being the unicorn that you are. Ale, Nanna, Helena, Rachana, Alyssa, Karina, Alexandra, Nova, Sarah, Lillie, Tika, other Alyssa, Angel, Isha, Aila, Cyra, Mishma, Wesaun, Sarena, Kelly, Aentee, Jacquelyn, Claudia, Andye, Sky, Becky, Kelly, Deanna, Liran, Jess, Tamara, Alexandra, Tiffany, Amber, Cilla, Alex, Ava, and Maryam. Overall, I think I've had a pretty good blogging year! 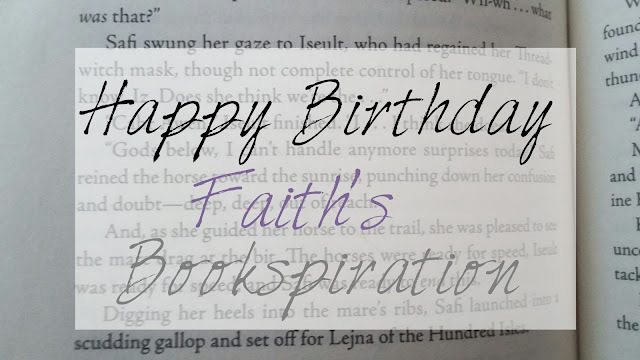 I'm so happy that I decided to start "Faiths Bookspiration"
Oh Faerie Fae, I feel so honored that I was mentioned in this post! You're one of my favorite new bloggers, and I really hope we continue to connect! Love ya girl!